Exports of feed grains in all forms totaled 100.5 million metric tons in 2015-16. U.S. exports of feed grains in all forms in 2015-16 totaled 100.5 million metric tons (3.96 billion bu. ), an increase of more than 300,000 mt (11.8 million bu.) from the previous marketing year and the second-highest level on record, new trade data from the U.S. Department of Agriculture show. The calculation of feed grains in all forms made by the U.S. Grains Council (USGC) accounts for feed grains exported by the U.S. in either unprocessed or value-added forms, which offers a holistic look at demand from global customers being met by U.S. farmers. It includes U.S. corn, sorghum, barley, dried distillers grains with solubles (DDGS), corn gluten feed, corn gluten meal, ethanol as measured in corn equivalents, meat and poultry as measured in corn equivalents and processed feed grain products. The highest export volume recorded by this measure was 100.6 mmt in 2008, only slightly higher than the 2015-16 total. In the marketing year that just finished, increased exports of corn, DDGS and pork offset reduced exports of barley, corn gluten feed, corn gluten meal, sorghum and poultry from the previous marketing year. Exports of unprocessed feed grains (corn, sorghum and barley) accounted for only 56.6% of total exports of feed grains in all forms. According to 10-year projections by USDA and USGC, feed grains in all forms have a positive outlook in the future as exports are expected to increase by 26.5 mmt (1.04 billion bu.) to 127 mmt (5 billion bu.) by 2025-26. These larger exports will come in the form of corn, ethanol, meat and poultry. 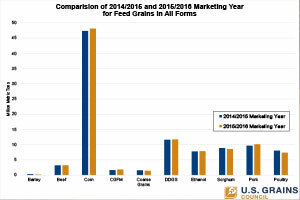 Looking at the bigger picture of U.S. grain demand, USGC said unprocessed feed grains accounted for almost 16% of U.S. feed grain production in the 2015-16 marketing year. However, exports consumed 27% of U.S. grain when also including value-added forms of feed grain exports. By 2025-26, exports of feed grains and products are expected to reach almost a third of U.S. production, with international markets for U.S. ethanol, meat and corn as an animal feed being the principal drivers.